Fennel, s / n, Urbanización Bel Air, 29692 Estepona, Spanje. Hotel Pierre & Vacances Estepona is Ideal for a relaxing golf break on the Mediterranean, this impressive apartment resort is built around a large free-form swimming pool where you can enjoy the warm Spanish sunshine. 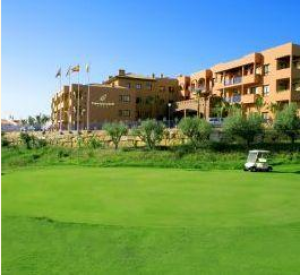 The Pierre n Vacances Caledonia Golf is surrounded by Los Flamingos golf course and other fantastic courses of the Golden Mile, just 10 minutes outside the exclusive resorts of Marbella and Puerto Banús. Its modern but traditional Andalusian-style apartments are set beside the huge outdoor swimming pool and sun terrace. Het hotel ligt aan de nationale snelweg, makkelijk bereikbaar vanuit Estepona's plaatsen van belang.